Select from the following panels and roofs. 24D 10" rise clear bubble dome panel makes every deck a fun adventure. Replacement bubble avail in both sizes. 31"W x 39"H. 16lbs. $490.00 Qty. 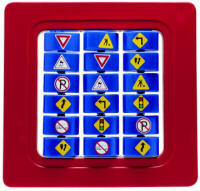 The classic game of tic tac toe is easy on this durable poly panel with spinners. Select panel and spinner colors. 44"x44"x3/4" 45lbs. 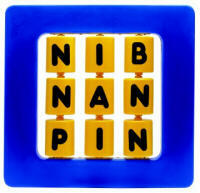 The very popular alphabet spelling game in a poly panel plastic design. Select panel and spinner colors. Assembly included. A playground version of the popular memory game. Select poly panel and spinner colors. Assembly included, 44"x44"x3/4" 52lbs. 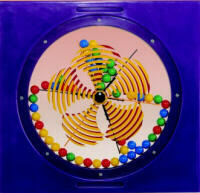 An interactive event where children turn the knob in the middle of the panel to create a kaleidoscope of colored balls. Children see the vital play between gears in this colorful interactive panel. Center knob turns every gear at once. DOUBLE WALL Keep the rain and hot sun out with this tough ribbed roof. Rotomolded plastic double wall construction. 60" x 60" x 26". 65lbs. Create a garden of fun with this gazebo roof. On piece roto-molded double wall construction. 111" point-to-point, 44" tall. 170lbs. 4'6" x 4'6" x 2'3". 75lbs.